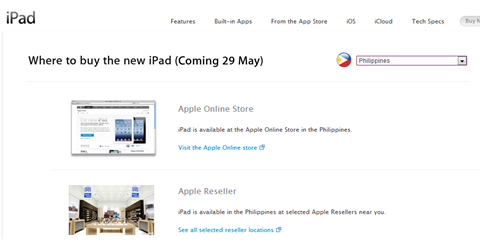 According to the official site of Apple Asia, the New iPad (aka iPad 3) will be officially available in Philippines on May 29th. These include official Apple resellers in the Philippines, the Apple Online Store, and through partner telecom firms such as Globe Telecom. There is no word about the price of the unit. The New iPad was Launched in March and features a high-definition Retina Display, an A5X chip that provides quad-core graphics, and 4G-LTE wireless data connectivity, among other specifications. There were also some news that they have acquired new iPad 3 at an amount of Php 23,200 for 16 GB Wi-fi only. So we hope to have it on a lower price from the online store. In addition Tattoo subscribers can get the new iPad at all Globe retail stores nationwide starting Tuesday, May 29, 2012. You may also check my experience getting my apple stuff via online store. It’s easy and fast.